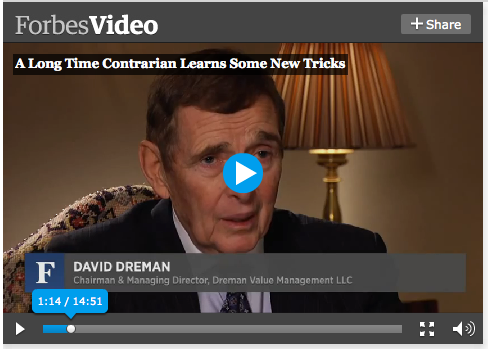 Contrarian guru David Dreman says he’s finding stocks as cheap as they’ve been at any time since 1982. Dreman tells Forbes’Steve Forbes that he’s bullish because valuations are low and companies have good cash flows and financial positions that are as strong as they’ve been in years. (A tip of the cap to Zack Miller of Tradestreaming.com for drawing our attention to the interview.) He says investors have been running from stocks because they fear volatility and they fear the economy will be in a depression-like malaise forever. He doesn’t see that happening, and thinks all the fear has created numerous opportunities. Dreman also talks a bit about portfolio management, saying he keeps a diversified portfolio of 50 to 60 stocks, with all the stocks weighted similarly. He adds that he buys stocks below the market valuation multiple, and always sells when it reaches the market average multiple, though he may sell sooner on “very bad news”. One change he’s made since the financial crisis: He’ll sell stocks of companies that post losses, even a short-term loss, and won’t buy them again until they are turning a profit.